Nothing is better than a warm bowl of soup on a cold and rainy Maryland day. One of my clients lent me an amazing cookbook called, “Change Your Brain, Change Your Body.” The cookbook is awesome and I highly recommend checking it out. It combines healthy brain boosting foods with easy recipes that leave you healthy and happy. I coach my clients on how calories do count and choosing the highest-quality calories is key. Choosing a healthy spinach salad packed with veggies and lean chicken is going to leave you energized and full. Losing weight is more than just calories in versus calories out. You need to choose the right foods to keep your body functioning in the best way possible. I have had many clients tell me, ” I had an ice cream and it was only 150 calories.” That’s great but imagine if you chose yogurt with fresh berries. You would be fueling your body with the right kinds of calories rather than just focusing on the calorie count. Remember to always focus on putting the freshest and healthiest ingredients into your body! 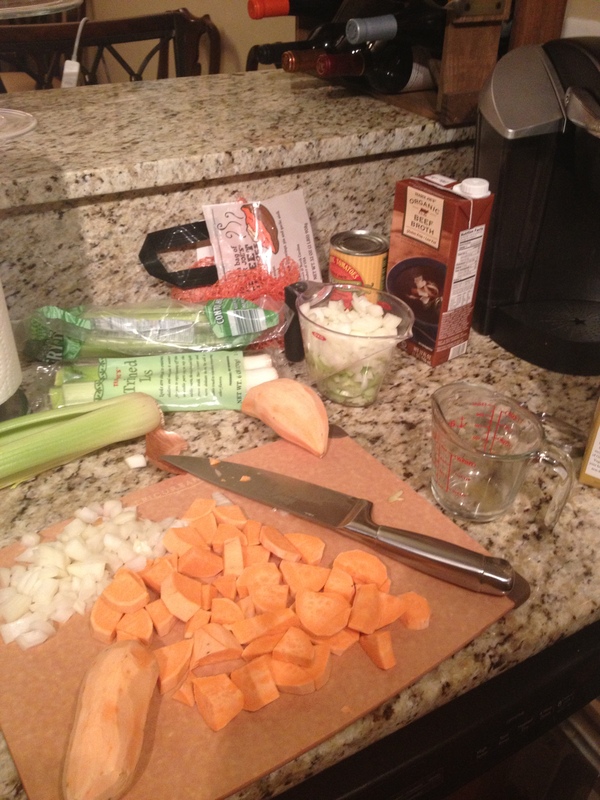 As I was reading, I found tons of amazing recipes and one really appealed to me – Sweet Potato Soup! YUM! It was quick, easy, and tasty! It’s also packed with brain boosters: sweet potatoes, almond milk, cranberries, garlic, cinnamon, and sage. Hope you enjoy! 1. Heat 3/4 cup vegetable broth in large soup pot over medium heat. Saute onions, celery, and leeks for 2 minutes. Then add garlic and saute for another minute. 2. Add 4 cups of remaining vegetable broth, sweet potatoes, cinnamon stick, and nutmeg. Bring to a boil then reduce heat to medium-low and simmer until potatoes are tender, about 10 minutes. 4. Use immersion blender or pour contents into a blender in batches. Blend until smooth. 5. Pour soup back into pot (if using a blender). Add almond milk. Then slowly add remaining broth according to preferred consistency. 7. Dish soup into bowls. Sprinkle sunflower seeds, sage, and cranberries in each bowl and serve. 8 servings, 81 calories per serving. 2 g of protein. 17 g carbs. 0 g fat. 0 g saturated fat. 0 mg cholesterol. 4 mg sodium. 2 g fiber.